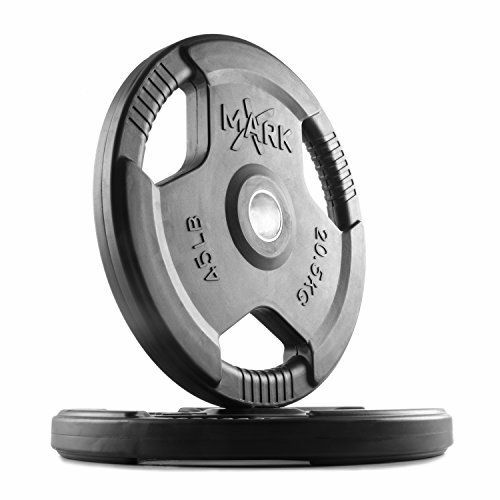 Designed with a triple grip to facilitate easy pick up, XMark’s Rubber Coated Olympic Plate Weights feature heavy-duty, split, crack and peel resistant rubber casing to protect your floors and other equipment as well as a recessed center, reducing the risk of pinched fingers as the bar is loaded. Use with an Olympic bar or use your Olympic plate weights on their own as “hand” weights as you lift, press and twist your way to muscle-building greatness. Achieve real results as you lift with XMark, the mark of excellence. XMark Fitness Premium Quality Rubber Coated Tri-grip Olympic Plate Weights – 1 Pair of 45 lb. Plates – Total Wgt. 90 lbs. It is no secret…XMark plate weights are higher quality. To reduce costs, all of our plate weights are sold and shipped in pairs or sets. It is a lot cheaper to ship a pair of plates instead of two singles. Save some money today. You will not regret purchasing XMark Olympic plates. Our team will greatly appreciate your business. Thank you for choosing XMark.